Extraordinary events that have taken place in January 2018 have attracted censure not only from the legal fraternity but from the citizenry too. Concerns raised in the press conference by the four Senior-most Judges with regard to the growing insecurity in the Judiciary due to the indifference of office bearers enjoying discretion with regard to the allocation of Cases to benches and allegations of discrepancies that have arisen out of this unfettered administrative power being granted in the hands of a single person as is laid down in the Supreme Court of India handbook of practice and procedure which expressly provides the right to order preparation of the roster by the Chief Justice of India , on whose order the Registrar shall prepare the roster is clear and therefore cannot be disputed. Post the press conference, questions that still stand unresolved are, firstly, whether the concerns so raised in the press conference have been addressed? 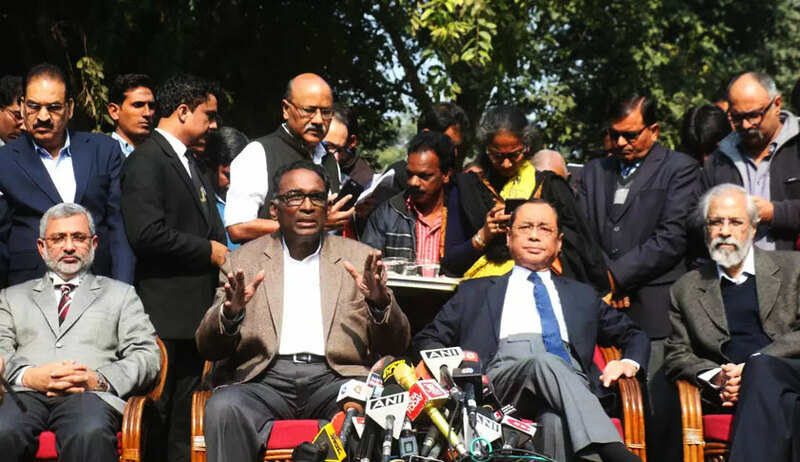 Secondly, as laid down in S.P.Gupta v. Union of India in (1981) that the, “Collegium is a guard against the absolute discretionary power conferred on the CJI” and in the Supreme Court Advocates-On-Record Association and Ors. v. Union of India (1993) that “The Chief Justice should be interpreted to mean the ‘collegium' of the first five judges of Supreme Court” and in continuation in the Special Reference No. 1 of 1998, should terming the CJI to collectively mean the CJI and his four senior-most judges be taken as the black letter of the law? Whether the Judiciary being the custodian of the Constitution be granted unfettered discretion to be vested in one person? And can such powers granted to one person on the administrative end to constitute benches for allocation of cases be considered an equitable practice which has a bearing on a citizen’s fundamental rights to judicial review which has to be independent and unbiased as laid down in 1987 case of Ranjit Thakur v. Union of India? All these and more questions have been in the recent past mooted time and again unproductively as seen in Asok Pande v. Supreme Court India through its Registrar and Ors (2018), Campaign for Judicial Accountability and Reforms v. Union of India, (2018) and in Shanti Bhushan v. Supreme Court of India and Ors., (2018) where the Supreme Court has reiterated that the 'Chief Justice with regard to Judicial responsibility is primus inter pares: the first among equals and in the discharge of his other functions, the Chief Justice of India occupies a position which is Sui Generis: ‘The only one of its kind’ and also upheld the decision in State of Rajasthan v. Prakash Chand and Ors. (1998) where it was held that the CJI is the master of the roster in allocation of cases in the Supreme Court. This being the current position, Does judicial propriety demand that there be a transparent method for allocations of cases which is an ideal of Constitutionalism? A similarity can be drawn between the concerns raised in all of these petitions in India which aims to bring about Judicial reforms by having in place procedures and rules with regard to the constitution of benches and initiatives taken by The European Network of Councils for the Judiciary (ENCJ) in the years 2013-14 to bring about transparency in allocation of cases and to understand Judicial practices within the European Union. By a special regulation laid down in a royal decree under Article 90 of the Judicial Code In Belgium, the allocation of cases is prepared by the President of the concerned court on the advice of the local Public Prosecutor, the local Bar Association, the Prosecutor General, and the first President of the Court of Appeal and is published in the Belgian Official Journal, which is available on the internet. In Bulgaria, the Supreme Judicial Council following the Regulations on Court Administration and the Administrative Procedure Code, and with adherence to the primary legislation being the Judicial System Act which offers transparency as the cases are allocated on the basis of a random selection principle through electronic method for the allocation of cases in courts to ensure impartial and unbiased justice, easing the caseload of Judges, which ensures the transparency of Court’s performance thereby curbing corrupt practices. In Denmark, the primary legislation being the Administration of Justice Act which regulates the allocation of cases by authorizing the President of the Court to allocate cases after discussion with the other Judges in the Court. The allocation is both – Topical and Numerical; thereby ensuring even and fair number of cases to be allocated to Judges based on experience and subject matter expertise. In Germany, an established presidium (presiding Council) which is elected by all the Judges of the Court which in upholding Judicial independence decides and makes rules autonomously without the influence of the President with regard to allocation of cases. The allocation of cases is to be scheduled beforehand to ensure equal distribution of cases amongst the Judges to ease the caseload. In the Supreme Court of Ireland, under Section 8 of the Court Officer’s Act, 1995, the distribution and allocation of the business of the Supreme Court is to be vested in the Chief Justice, in whose absence, the senior ordinary judge of the Supreme Court assumes the power to allocate. In Northern Ireland, allocation of cases is under the direction of the Lord Chief Justice (President of the Courts), assisted by the Presiding (senior) Judge. A perusal of the Judicial practices of these Countries offers ample insights on administrative discretion not given to any single person and allocation of cases in all the above-mentioned countries being a collective work or electronic allocation done thereby reducing human interference. Taking a cue from the above practices is it time to introspect whether any affirmative action has to be taken up in India or the law as laid down in Supreme Court of India handbook of practice and procedure granting powers to be vested in a person that was adopted from the Government of India Act 1935 be followed sans Constitutionalism? Is there a need for a judicial overhaul in India? Does the statutory body created by the Parliament like the Bar Council of India whose primary functions include to ‘promote and support law reform’ as well as from the Department Of Justice which is a part of the ministry of law and justice which spearheads ‘judicial reforms and also works towards providing access to justice to all have on them the onus of bringing about Judicial reforms? Will the setting up of an independent, impartial supervisory/monitoring committee looking into the allocation of cases at the center, as well as the states solve the problem at hand? Whether a computerized allocation of cases is the remedy? Whether the allocation of cases should be a collective initiative involving the collegium and the Registrar? These and many more answers are yet to be answered. Babitha.N.S.Raju is an Adjunct Faculty of Law at University Law College, Bangalore University.The Article has been co-authored by Aishwarya. S.M & Siri.Yale who are Researchers/students at University Law College, Bangalore University.